The TL screw conveyor drive consists of a component gear drive (which equals the TR gear drive plus the gear drive adaptor and minus the torque arm assembly), a drive shaft kit and a trough end adaptor kit. To convert a TR to a TL, a TR/TL conversion kit, along with a drive shaft kit and tround end adaptor kit is required. The TL drive shaft kit contains a removable shaft, locknut, lockwasher and key. 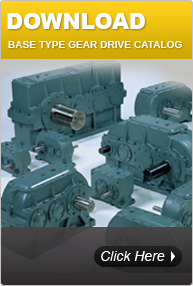 TL drive shafts have a tapered output end to avoid binding. The trough end adaptor kit contains the trough end adaptor and packing gland assembly. Dorris trough ends are available. 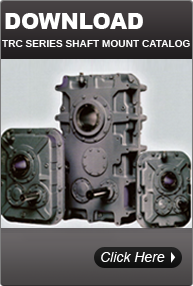 All trough end adaptors can use either the standard or high performance packing gland assembly. C69 adaptor uses 1-1/2 inch drive shaft; C924 adaptor uses 2 through 3-716 inch drive shaft. Consult factoryfor trough end clearances for the other motor mounting positions not shown.